A term that means what you want it to mean. It's crazy. 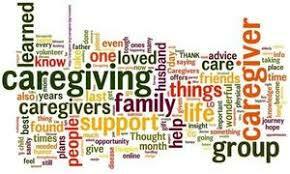 Search for the term 'caregiving technology.' At the top of the retrieved page – an ad for ClearCare help you 'improve client and employee management' – sounds like paid (agency) home care. Over at AARP, there is a long list of resources (non-tech) on the AARP caregiving site for family caregivers, who may use paid care. There’s the 2017 AARP report that surveys caregivers about what they want from technology -- they are interested in but not currently using. There’s the Family Caregiver Alliance report that lists technologies from firms, but was last updated in 2013 (perhaps the date of this FCA list). The National Alliance for Caregiving (NAC/AARP) report is dated 2014 – and focuses on a vision for what caregiving technology should be. The biggest list is also from AARP – but is it too big? Parks Associates provided 6 broad categories and examples in the 2016 Caregiving Innovation Frontiers report – the broadest categorization and definition of 'care and caregiving.' It stretches the mind a bit to include transportation and meal service, but that broad conceptualization is derived from all the previous material – caregiving is…what caregivers need. This report sizes the market for caregiving technology as $279 billion by 2020. That sounds huge. But unlike other markets (for example, packaged food sales at $380 billion) – the caregiving market participants as the report defines do not see themselves as being in a single market that is paid or tracked as a single market – it includes categories, like meal delivery that serve multiple demographic sub-segments delivering meals to themselves. Consider a simpler bucketing scheme. Although it could also be argued that all of the categories of technology for aging in place are relevant to caregivers, let’s not argue that. Within that report are subsets of sortable tools and apps. And streamlining the definition and scope of caregiving technology could help vendors who think they are in the space to map themselves into a simpler set of categories – and perhaps do so from the caregiver’s point of view – how about these buckets? Find Care. In the hair-on-fire life of caregivers, often catapulted into responsibility, finding care is top-of-mind. Tools for finding home care, home health care, senior care, respite care, wound care specialists and so on – providers understand search algorithms and have positioned themselves online accordingly. Vetting of care providers? Not so much. For home care, as an example, that leaves the thinly-populated (and often glum) Yelp review process, Caring.com reviews, similar sites like CareLinx and Consumer Affairs. Manage Care. The home care software industry is made up of licensed process automation software for each of the business steps in running an agency. For managing your own care process, there are free tools like the lists in Caring.com or on the AARP website. In addition, consider tools for medication management, camera or sensors for remote monitoring of care situations - even dealing with life planning and end of life decisions. Enrich Care. Long-term in-home caregiving is ever more likely be the rule, not the exception. Longer life expectancy, smaller retirement savings, plus unanticipated healthcare expenses conspire to keep people in their homes. Expect more creative mechanisms, including Voice First caregiving technology, to help older adults stay at home and accommodate a shortage of professional caregivers. We will see more websites and tech-enhanced services which will be bucketed as 'caregiving technology' for sharing care as co-housing roommates or neighbors, or facilitating cooperative arrangements between college students and seniors. Permalink Submitted by Larry Diamond (not verified) on Wed, 10/10/2018 - 14:21. Tons of companies are going after a finite quantity of people available who want/can take care of elders. Permalink Submitted by Laurie Orlov on Fri, 10/12/2018 - 08:38. 11,000 individual companies, no collaboration on transportation (long distances between where workers live and care recipients are) or work assignments and shifts. When an industry is that inefficient and the demand exceeds supply, eventually efficiencies are introduced. Add remote monitoring cameras, sensors, voice-based interactions, schedule sharing -- all part of making the industry work for people who need it. Permalink Submitted by Laurie Orlov on Thu, 10/11/2018 - 07:04. While there may still remain a requirement to consider the role of technology in assisting the caregiver, I still believe that the more important priority is empowering the senior. Building solutions that augment them seniors to be more independent and you lessen the requirement for caregivers to look for solutions. This will be increasingly important as the largest component of our aging population are the Boomers, who are already tech-savvy, have always been a generation seeking greater independence and will demand solutions that enhance their lives, not reinforce the negative image of a being dependent individual. There may still value in caregiving technology and services today, but doing so is addressing the results of seniors not having adequate resources at their disposal to care for themselves. What person at age 30 40, or 50 unless significantly disabled, seeks for other people to take care of them. Why do we think that at age 70 or 80, that we prefer to be "taken care of"? We both know that the majority of seniors want to "age-in-place". WHERE are the products that enable this?